I remember a geography textbook in secondary school titled ‘A Sense of Place’. I cannot recall all of the content that it covered, but it included subjects such as settlements, conurbations and transport infrastructure, and the such like. Some of these topics have influenced my choice of painting subject and much of my artistic philosophy is rooted in a feeling of place. Seven months ago I created my first blog post with an article titled ‘Putting my art on the map’, I wanted to introduce the reader to my home location of London which has been the basis to almost all my landscape painting over the years. A map illustration in the article showed the areas of the capital that I visited to create the art. Many of the areas that I painted included depictions of well known London landmarks, but also ordinary street scenes and edgy backlands. British contemporary painter Danny Markey has been a regular point of reference for my art, with his depictions of suburban banality. His austere landscapes are precisely that: banal depictions of banal UK landscapes, but it appeals more to me on the opposite level because I feel that it depicts places that are actually somewhere rather than anywhere. These are not anonymous locations: The illuminated curtains of nocturnal houses are real homes containing real lives. 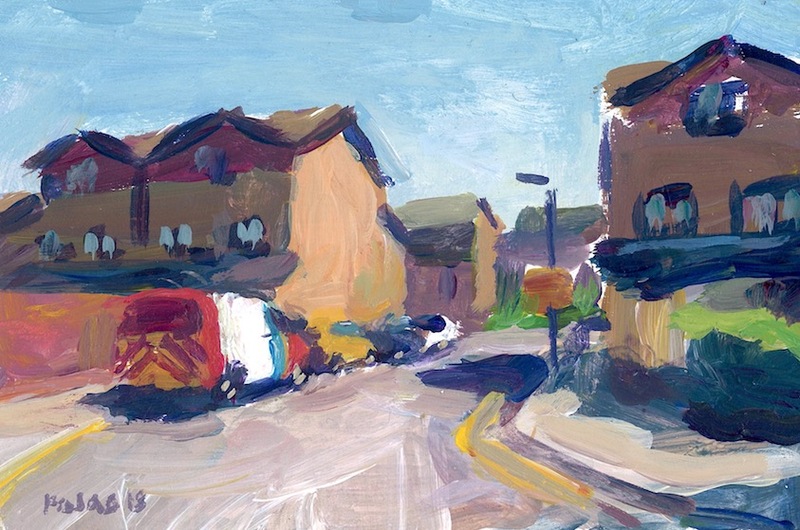 The driveways of suburban dwellings in his paintings have real addresses. The work has the familiarity of UK scenery. The London Underground has helped me to gain a sense of location. The stations have an enchanting quality in that they are places to take you places. The Underground sign, though standard and corporate in design, has the unique place name of the station displayed inside it. This could be considered as a contrast to other modern institutions such as shopping centres, where brand names, cinemas, and fast food outlets create a sense of anywhere rather than somewhere. Such uniformity would have no doubt been a delight for an artistic movement such as Pop Art, that explored consumer culture and repetition of material goods. I also find logos and signage visually fascinating but I often balk at the blandness and footloose society that post-modern areas such as shopping centres reflect, where local identity is compromised in some way. During a recent holiday visit to Bratislava in Slovakia I noticed one such shopping centre which could easily have resembled any in the UK, complete with the exact same high street brands. In recent times I have included the postcode of a location into the title of my paintings to help reinforce the idea of place and also to free me to paint locations that are not readily identifiable. I find enjoyment and inspiration in simply experiencing places in an everyday context, coupled with the romance of discovering somewhere. For me there is a lot mileage in this as an artistic concept and, in the global modern world, the idea of home is something to protect.